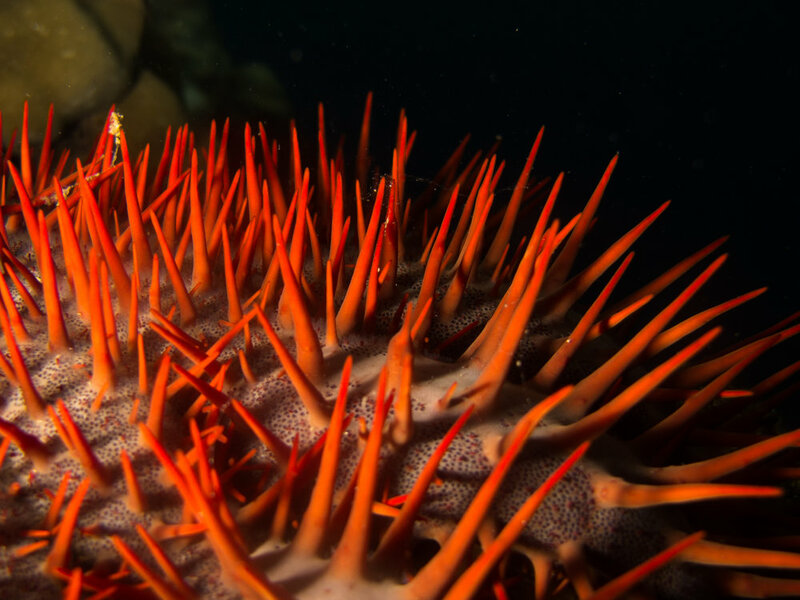 Frequently Asked Questions about Crown-of-Thorns starfish, their population outbreaks and the vinegar method. Below are some of the most common questions I have received regarding the use of vinegar cull COTS, why outbreaks occur, and what we can do about them. While I don't claim to have all the answers, I have included my responses below. You can find any relevant references at the bottom of this page. If you have any queries that are not covered here, or on the page describing the vinegar method, please do not hesitate to contact me. 1. Why do outbreaks occur? This is truly the million dollar question! There are two main theories: 1) the nutrient runoff theory states that excessive nutrients from terrestrial runoff causes the COTS larvae to survive at a higher proportion than under normal conditions. Given the extreme fecundity of starfish (a single female has been quoted as being able to produce about 70 million eggs per spawning season), a small proportion increase in survival is enough to trigger an population explosion. 2) The depletion of predators theory points at the absence of predators of juvenile or adult COTS, and suggest that predators that were historically abundant may have kept populations down. We don't fully know or understand the exact cause of the outbreaks, and in all likelihood it's probably a combination of factors. However, the absence of spines in the fossil record, and a lack of historical descriptions of outbreaks suggest that these outbreaks are a new phenomena on reefs. 2. Are COTS natural on the reef? Yes, they are not an introduced species! They are a natural inhabitant on coral reefs and can even be quite beneficial to reefs when present at low densities. This is because they tend to prefer to eat faster growing corals, and by removing them they give slower growing corals a chance to play catchup. This increases the diversity of corals present at reefs. However at high enough densities they consume too much corals for the reef to be able to recuperate. 3. Do COTS play any positive role in the marine environment? In low numbers (i.e. natural densities) COTS do have an ecological role to play. Because they prey predominantly on the fast growing Acropora corals, it is believed that they promote coral diversity by removing faster growing corals and giving slower growing corals an advantage and chance to play ‘catch up’. However, when they are present in outbreak densities, they consume all types of coral, and can have devastating impacts on the coral communities instead. Direct control efforts are unlikely to be 100% effective at removing COTS (you’re never going to find them all), so you are unlikely to affect this ecological role by conducting culls. How did you find out that the vinegar worked? I found out that vinegar had been trialled previously (in Japan) but with a very low mortality rate (60-70%). Because I was in Papua New Guinea, where specialist chemicals are not available, I decided to try a few different methods to see if I had the same result, and if I could improve the method. I tried a few different things first, like alcohol but no method worked that well. In fact the alcohol gave the starfish superpowers (almost!) and they could break out of my cage and would then try to hide nearby. Luckily they weren’t as good at hiding as they were at escaping so I got them back again! I knew that vinegar is a weak acid, and most successful methods so far have been acidic, and since we had some in the kitchen cabinet I gave it a try, and it worked! I improved and refined the method by using a smaller needle (which reduces the amount of chemical that leaks out of the starfish through the injection hole). I turned out, that another research group was working on vinegar and lime juice at the same time, in Vanuatu. In their study, they used a smaller volume of vinegar at a stronger concentration. Similar to my findings, they found that these methods do not achieve 100% mortality in a single injection. I speculate that the stronger concentration cause a more immediate reaction in the starfish, which allows them to slough off arms and survive. They do however reach 100% mortality with multiple injections. Multiple injections force workers to extract the starfish form the reef matrix, which substantially decreases the rate at which injections can occur. This research highlights the importance of using the methods as described. My recommendation is therefore to use a lower concentration vinegar (4%), at a higher volume (20ml), which achieves 100% mortality in a single injection. In addition, while their paper does not discuss the size of needle used, multiple studies have found that the size of needle is critical to achieve 100% success. Therefore, I recommend using a 16gauge needle. 3. Is culling COTS ethical? 4. Can injections cause spawning? This is quite a persistent rumour, and I don’t know really where it comes from! First off, I think people mistake their digestive glands for eggs. The digestive glands is like a frilly ribbon, often orange or dark red and it can become exposed after injection. Second, in regards to actual eggs and sperms being released, I have heard of the COTS “stress-spawning” when subjected to handling or any kind of stressful interaction. However, in the ~1000 or so COTS I have injected, I have only seen this happen 3 times. I also asked a colleague who has been more or less involved in large scale culling efforts the GBR in the past few years (with an estimated 350,000 COTS culled, using bile salts) and he said he has seen it only a handful of times. So I guess the answer is yes, sometimes they do spawn in response to injections but this is very very rare. More importantly however is whether this spawning is a concern? COTS usually aggregate to spawn, and follow cues based on light and temperature to coordinate their spawning. Eggs and larvae can only stay alive and travel about 100m prior to fertilisation, so in the rare event that injections cause one to spawn prematurely, it’s quite unlikely to be within the vicinity of another spawning COTS. It’s worth remembering that injections can’t cause a COTS to spawn unless they are already ready to spawn, i.e. have eggs and sperm that are ready to be released. This means that any spawning COTS would have spawned anyway, just in sync with many other COTS, thus increasing chances of fertilisation. I saw this first hand, as I collected a large number of COTS around Lizard Island in 2015. A majority of the COTS were in holding tanks, while the rest were in aquaria. After the acclimatisation period, I inject a subset of COTS with vinegar, and three individuals spawned. When I checked the holding tank, the remaining COTS had also spawned, despite not being injected with vinegar. This suggests that I happened to collect these starfish on or around the time they would have spawned naturally on the reef, and the stress of collection (and in 3 cases, injection) caused them to spawn prematurely. Given that each female can produce around 70 MILLION (!) eggs in a single spawning season, the value of removing starfish outweighs the risk of triggering spawning in a small proportion of individuals (which would have spawned anyway). 5. How does vinegar kill COTS? While I haven't been able to pinpoint the exact cause of death, it is likely that the weak acid is enough to slowly break down the tissues of the starfish. Starfish are virtually unable to regulate their pH, so this weak acid is enough to cause them to break down. I've read that COTS and cyclones are the two leading causes of destruction of the Great Barrier Reef. Is this correct? This was true up until the two mass coral bleaching events of the past two years (2016 and 2017). While it's hard to estimate exactly what has caused a 50% drop in coral cover on the Great Barrier Reef (GBR), researchers at the Australian Institute for Marine Science (AIMS) have suggested that (prior to the recent mass mortality events) Crown of Thorns (COTS) are one of the leading causes (De'ath et al 2012). What makes your finding regarding vinegar useful – how will it change the way COTS are dealt with? The primary improvement of this method over others are in how easy it is to access, store and administer. Current methods (bile salts) work well, however they are quite expensive, hard to access and has quarantine concerns. Vinegar can be bought at any supermarket and is roughly half the price! While the ideal way to deal with COTS outbreaks would be to stop the outbreaks from occurring altogether, we still know relatively little about what causes them. For now that limits the methods we can use to those that manually remove each starfish from the reef. For that, vinegar is a great method, and with a sustained effort we can save individual reefs. How do you know that it's the sea stars that are damaging the reef? We can see them eating the corals! It’s quite a fascinating process! They push out their stomachs out of their ‘mouth’ and digest the coral outside the body, and then slurp up the nutrients. The pale yellow soft looking tissue you can see in the picture inside the ring of thorns is the stomach. What is the benefit of injecting the starfish? If someone has to go up to them anyway, why not just kill them with a spear or other object? The starfish have amazing regenerative capacities, so spearing or even cutting them into little pieces won't kill them, in some cases it may even make more of them! The only direct method is to either collect them and remove them from the water, or kill them using lethal injections. Collecting them is much slower, and comes at a higher risk of injury (through spiking) for the divers. Where in the sea star's body do you inject the vinegar? The sea star has a water based skeleton called the water vascular system. Therefore I inject the vinegar straight into that system so it spreads around the whole body of the starfish quickly. By injecting there you are likely to hit the polian vesicles (a sac-like profusion of the vascular system), which connects to the rest of the vascular system. By injecting at the top of one arm we hit the bubble and allows it to spread around the starfish. Are there other ways to eradicate the sea stars apart from using bile or vinegar? The best way to get rid of the outbreaks would be to stop them from happening altogether. We don’t fully understand the reasons outbreaks happen, but we think it’s due to reduced water quality. If we put a lot of nutrients in the water (from farms mostly), more of the babies survive and populations explode. Each female starfish can produce 65 MILLION eggs in one season, so we only need a small increase in the proportion of survivors to start an outbreak. So addressing water quality problems would be the best way to stop them. Until we can sort out water quality, we have to fight outbreaks after they have already happened. People have tried many different methods to fight the seastars, including manually removing each one. The spines are quite sharp and have a weak toxin, so it really REALLY hurts if you get stung! The best methods therefore allows the scuba diver to stay away from the seastar. We also want to make sure that the method is safe to other marine animals, in case they decide to have a nibble on the COTS after we have injected them! So far the best methods are bile and vinegar, however people have tried a lot of different methods. For example, one of my students tested citric acid (lime juice) and I have heard rumours of fermenting coconut water! What causes more damage - cyclones or COTS? The Australian Institute for Marine Science (AIMS) have estimated that prior to the recent mass bleaching event (2016 and 2017) cyclones caused 48% of the damage to the Great Barrier Reef, and COTS 42%. However, they cause different kinds of damage. If a storm moves in over a reef, it will probably break up all the coral into tiny little pieces, so the reef inhabitants loose both the living coral AND the structure it provides at the same time. Many fish hide in between the branches from predators. When a COTS eat the corals however, they only eat the living tissue, and leave the coral skeleton intact (you can see the white skeleton in the picture with a COTS on). Eventually the coral skeleton will also degrade but it can take a few years until it has been turned into rubble. You can hear me talk about what that means to the fish in this talk on Youtube. Why has there been a 50% drop in the amount of coral? The simple answer is that humans have caused the drop in one way or another. Prior to the recent mass bleaching events in 2016 and 2017, AIMS estimated that 50% of the live coral has been lost on the Great Barrier Reef in the past 30 years. They believe that cyclones caused 48% of the damage, COTS 42% and the remaining 10% is caused by Coral bleaching. Bleaching and to some degree cyclones (at least higher frequency and intensity of cyclones) are related to global climate change and the greenhouse gasses humans have put out in the atmosphere. COTS outbreaks are probably caused by decreasing water quality and overfishing of their natural predators. Who figured out the possibility of sending robots down? The researchers who are working on the COTSBot are affiliated with the Queensland University of Technology. I don’t know them, and we don’t actually work together, but it sounds like a great project! How many starfish are estimated to be in the barrier reef? It’s very hard to know, but it has been estimated that there are between 4-12 million starfish on the GBR alone! We have to remember that there are outbreaks all over the indian and Pacific Oceans, including Papua New Guinea, Vanuatu, Solomon Islands, Fiji, the Maldives, Hawaii and a few more places. It’s a really big problem at the moment, especially since we’re expecting there to be a lot of coral bleaching around the world this year and next year (strong El Nino). Together the impacts of COTS and bleaching in the same year could have really big impacts on coral reefs of the world.